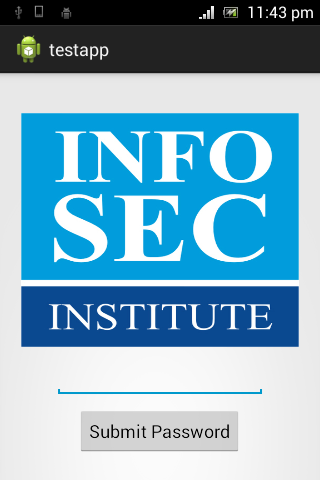 Mobile Application Security is one of the hottest segments in the security world as security is really a big concern with growing mobile applications. In this Article, we will go through the attacks associated with Android Application Components. What are Android Application Components? App components are essential building blocks of an Android App. Every app is built as a combination of some or all of those components which can be invoked individually. There are 4 main components in Android which are explained below. Activity: An Activity provides a screen with which users can interact in order to do something. Users can perform operations such as making a call, Sending an SMS etc. Example: Login screen of your facebook app. Service: A Service can perform long-running operations in the background and does not provide a user interface. Content Providers: A content provider presents data to external applications as one or more tables. In other words, content providers can be treated as interfaces that connect data in one process with code running in another process. Example: Using content providers, any app can read SMS from inbuilt SMS App’s repository in our device. *READ_SMS permission must be declared in the app’s AndroidManifest.xml file in order to access SMS app’s data. Broadcast Receivers: A broadcast receiver is a component that responds to system-wide broadcast announcements such as Battery Low, boot completed, headset plug etc. Though most of the broadcast receivers are originated by the system, applications can also announce broadcasts. This article focuses on demonstrating the methodology to attack and secure vulnerable Activity components of Applications. As shown in the figure below, it has two activities. The first activity takes a password as input. If the user enters the correct password he will be landed in a page which says “Private Area”, else he will get a message “Wrong password”. For test purposes, the password to login is set as “password”. Ideally, the first screen should use an intent and invoke the second screen if a valid password is entered. We need to perform black box testing on this app to see if we can bypass the authentication by directly invoking the welcome screen. A Non Rooted mobile device to install the app. 2. Analyze AndroidManifest.xml file for exported Activity components. Every Android App has a package name and every Activity has its own Class name inside the package. The initial steps are to find out the name of the package and names of the available sensitive activities. Though, there are other methods to get this information, looking at the AndroidManifest.xml is a good approach. We can get the AndroidManifest.xml file by decompiling the application using APKTOOL. 3. Now, decompile the apk file using the following command as shown in figure. 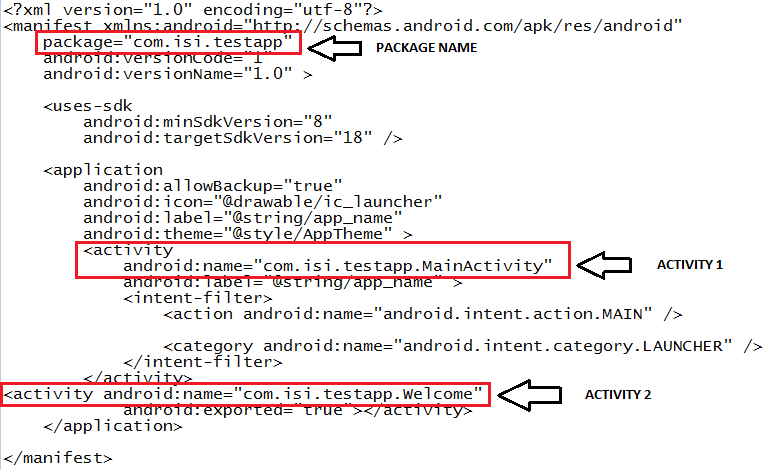 As shown in the figure below, we should now be able to see a new folder named “testapp” with AndroidManifest.xml file inside it. Now, we need to search for the package name and its activities. All the activities will be registered in AndroidManifest.xml file using <activity></activity> tags. So, anything inside these tags will be an activity. Looking at the AndroidManifest.xml file, we are able to see two Activity Components and the package name as shown in the figure below. By examining the above figure, it is clear that we got the following information about the app. com.isi.testapp is the name of the package. com.isi.testapp.Welcome could be the activity we are getting after providing the correct password. Our job now is to launch Welcome activity without providing any password in the first screen. We can perform attacks on vulnerable activity components in several ways as mentioned below. 1. Launching sensitive Activities with Activity Manager Tool. 2. Using a Malicious App to invoke Activities of other apps. 3. We can also use Mercury framework for performing these attacks which will be covered in later articles. Activity Manager is a tool that comes preinstalled with Android SDK and can be used along with “adb shell”. This tool can be used to launch activities and Services of an application. We can even pass intents using it. 2. Type in the following command to launch Welcome activity. We should now see the welcome screen fired up by am tool without providing the password. Another way of invoking other application’s activities is to write a malicious app and feed it with the name of the package and activity to be launched. The figure below is a code snippet to launch an activity where in com.isi.testapp.Welcome is the activity to be launched. In our case, malicious app doesn’t require any permission to launch “Welcome” activity of vulnerable app. The same attack can be reproduced with mercury framework. We will discuss mercury framework later in this series. In the AndroidManifest.xml file of our application, we should add the following attribute to the application component to be secured. 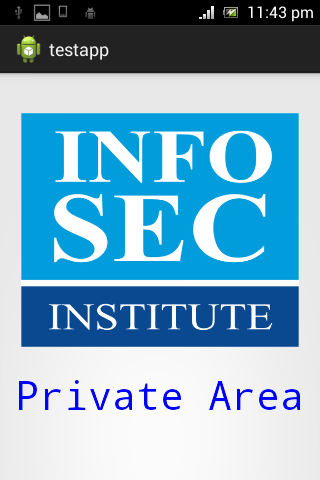 In our case com.isi.testapp.Welcome is the activity to be secured. The above code restricts other applications or any system component other than the current app from accessing this Activity. Only applications that have the same user id as the current app will be able to access this Activity. android:exported attribute is not the only way to limit an activity's exposure to other applications. We can also impose permission based restrictions by defining custom permissions for an activity. This is helpful if the developer wants to limit the access to his app’s components to those apps which have permissions. Note: The above security controls are applicable to any other Application component which we discussed in the beginning of the article. Note: You can download the sample application used in this article and follow the steps along with us. Feel free to post your suggestions and Questions.